You are here: Home » Drinking Water » How Much Water Should You Drink? I continue to receive questions about how much water you should drink. I wrote a long detailed article about this issue in the past, but it is worth mentioning again…but this time in short form. I don’t think anyone really knows how much water you should drink. No two people are the same and there is no set formula. To be sure, your body does burn off water by breathing and sweating, so it is important to replenish each day. But how much? The EU recently had another brain fart when they recommended that bottled water companies were not allowed to claim that drinking water would help with dehydration. When you get to be my age, you have heard, read, and seen a lot of dumb stuff, but that one is a beauty. What did jump out at me in the article was the fact that the report recommended that people drink 1.2 liters of water per day to replenish lost liquids. Most of the literature that I have read recommends 8 glasses per day (2 litres) or more if you perspire. Others claim that you don’t require that much water. Some of the Olympic athletes that I have worked with drink up to 8 liters of water per day when they are training. 6) You can tell if you are drinking enough water by checking out the color of your pee. If your pee is almost clear or a light yellow, your water consumption is in good shape. If your pee is dark yellow, start drinking more water. It is virtually impossible to drink too much water as your kidneys can process 15 liters (4 gallons) of water per day. Extremely rare cases of over consumption of water have been reported in infants and marathon runners, but only in situations that any clear minded person would recognize as excess. Drink up…the benefits are many! ← What Is Good Health Worth? 2 Responses to How Much Water Should You Drink? -Drink slowly, not a whole glass/bottle at once, to better let the body absorb the water – even straight from the mouth. 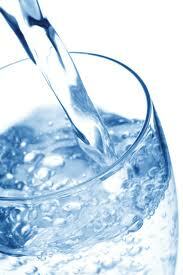 -Do not drink much water during meals, especially alkaline water as it may disturb the food digestion. Drink rather 30-60 mins before and 1h after and in between meals. Eat sallads during meals if your throat feels dry when chewing. -This applies to ordinary water If you drink too much of this then you’d better add salts in it as the ordinary water may flush out more electrolytes from the body than giving. Another word for “water intoxication”. Not a pleasant reault and may lead to death.